Kabul: She has known terrible torment, but talks about it with a smile. Married off at 12 and a mother at 13, Afghan divorcee Laila Haidari now lives to help drug addicts in Kabul, who call her mother. Thirty-five years old, she was born and brought up in Iran, where her refugee parents lived out war and political instability at home, coming to Afghanistan for the first time only a year ago. Brought up by a violent mother, she spent 13 years with an abusive husband before being ostracised by her family for daring to divorce a cleric and today rarely sees her three children. The woman who has spent a lifetime fighting her lot now devotes her energy to drug addicts sleeping rough on the streets of the Afghan capital. In a country that produces 90 percent of the world's opium, yet has little public health infrastructure, addiction is an alarming problem. According to the counter-narcotics ministry, there were 1.5 million addicts in 2010, including one million users of hard drugs such as heroin and opium. With little understanding of treatments, life for addicts can be hell. Malnourished, beaten and sick, many gather under the Pul-i-Sokhta bridge over the Kabul River, where dozens of them died in the freezing snows of last winter. Whenever Haidari found herself crossing the bridge, she began to think that as she had defied her husband to get an education and always struggled to help those worse off then herself, she could do something for them. "Mother Teresa... was always good to people. I always wanted to be like that. Then I studied about Gandhi and Che Guevara. They did something for humanity. So I asked myself 'what could I do for others?'" And it is the addicts under the bridge who have benefited from her help. "Even the first day, when I went under the bridge, one man, who was older than me started to call me mother. The others followed," she says. Haidari had originally come to Kabul after divorcing her husband and embarking on a career as a documentary maker, visiting to attend a film festival. But instead her life took a completely different turn. Helped by an associate, who has since pulled out, she built a shelter in western Kabul, known as "mother's home", able to accommodate up to 20 addicts a night. The shelter is inspired by the Narcotics Anonymous method of detox, which uses only group therapy and no medication to overcome addiction. Jane Nickels, a spokeswoman for the US-based organisation, says there are 60,000 therapy meetings a week all over the world. But apart from 50 staff in California, NA activities are all voluntary. Volunteers help other volunteers, and so Nickels was unable to account officially for Laila or any other affiliates in Afghanistan. The type of treatment also has its detractors. "It's useless," says one Western expert in Kabul. "Addiction is mental illness. You need medication to recover." 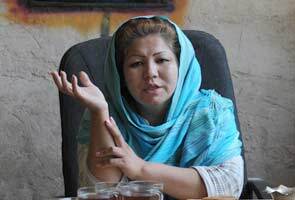 But undeterred and determined, Haidari says she has helped 300 addicts in less than a year. It was not possible to verify the claim, with Afghan authorities saying they have no knowledge of her shelter. AFP met 12 addicts who all said that thanks to Haidari and her "Life is Beautiful" charity, they are in recovery. "My real mother tried to take me to some places but she didn't succeed. So she left me," said Ali, 34, a former soldier who became an addict in Iran and says he has been clean for four or five months. Fatima, a policewoman in her 40s whose son has been under Laila's care for two weeks, said: "I'm happy he's got another mother. He looks better now." But beneath the surface, there are lingering tensions. The neighbours complain about noise at night and resent the presence of addicts in their neighbourhood and have even accused Laila, who also lives at the shelter, of being a prostitute. Several months ago, she claimed to have escaped a murder attempt, but the circumstances and who was responsible remain unclear. She is also constantly short of money. But nothing seems to deter her. "When I go back to the life I had before, I have the impression I was not living. But what I've been doing for nine months with these guys... that's beautiful!"